It’s getting to be about that time. One of the interesting things about this industry is the constantly overlapping cycles. 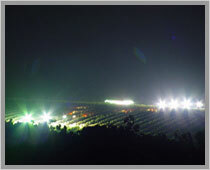 As we get ready for the beginning of the 2011 harvest, we are also concluding the work begun one or two years ago. 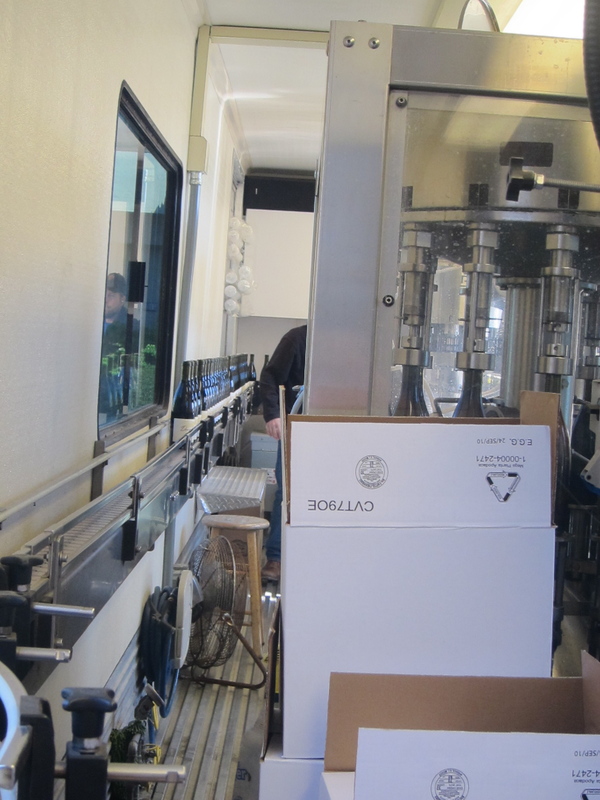 Last week, we bottled three Donelan wines: the 2010 Nancie Chardonnay, the 2010 Cuvee Keltie, and the 2009 Richards Family Syrah. This process took a couple days worth of preparation and execution, beginning with racking the wines and getting them into tanks. 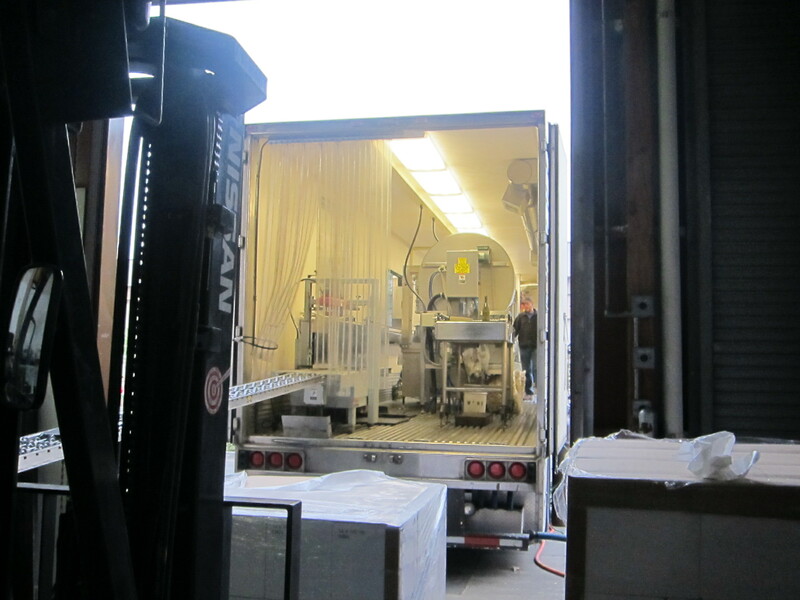 Then one morning I arrived at work to find a large truck pulled up to the winery. it just backed right up to our door . . . 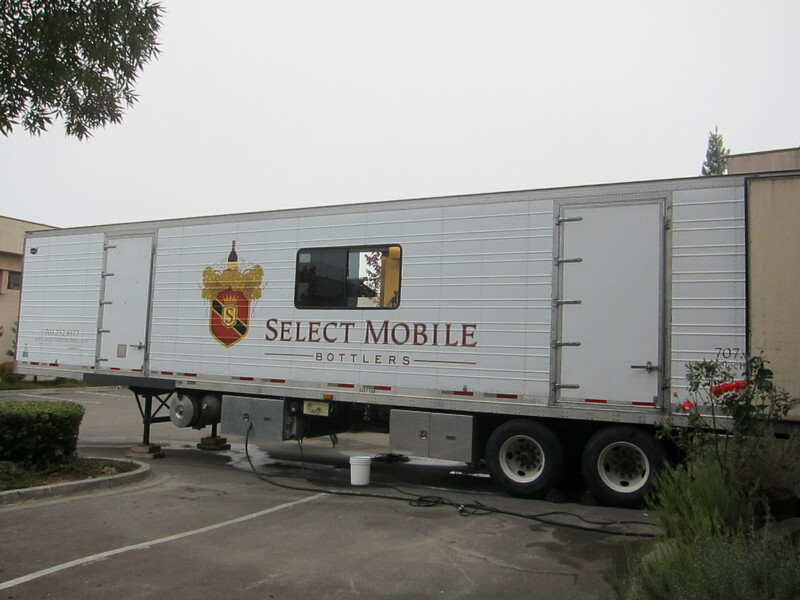 This mobile bottling operation serves small wineries like us who don’t have their own bottling lines. We rolled up our sleeves, welcomed a few temp workers onto the team, and knocked out 900 cases of wine in about four hours. Which felt, up on the assembly line, like approximately five minutes. Then we gorged ourselves on pizza and beer. This thing moves fast. At the beginning of the line we tipped boxes of empty glass onto a conveyor belt that shuffles them into a rotating series of spigots, filling each bottle from a hose that is hooked up to a tank in the cellar. 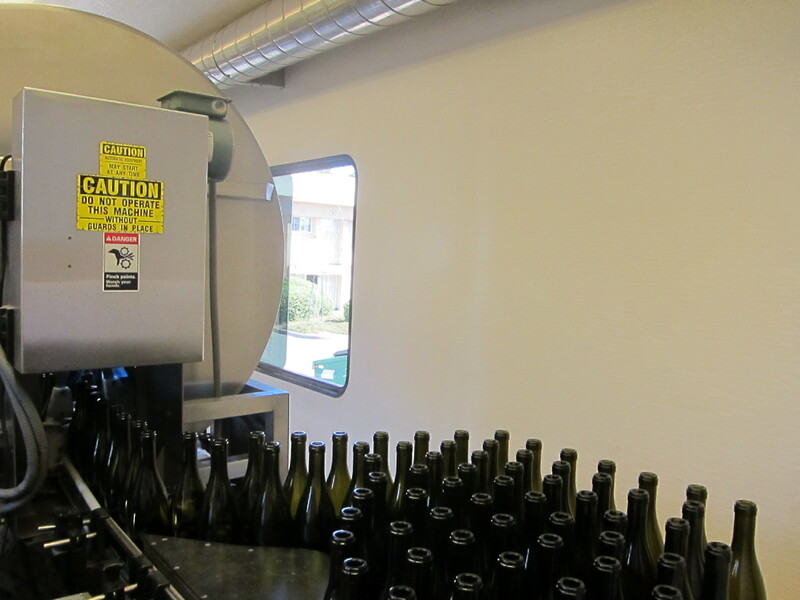 Then the bottles travel down the line to be corked, labeled, boxed, taped, and stacked onto pallets for storing. empty glass entering the conveyor belt . . .
Three cheers for the industrial revolution. My first task was Second Boxer, completing half-filled boxes and sending them down the line to the tape-gun. The tricky part was timing and avoiding overcrowding on the conveyor belt. Once I got my rhythm down, I was so in the zone that I started seriously contemplating settling down to a nice quiet life of professional bottling. Things got more complicated when we switched tasks. First Boxer turned out to be much harder. Then I moved to Box Emptier, moving the empty glass off pallets and onto the conveyor belt. And the pallets just kept coming. No sooner had I almost emptied one than Joe was sitting there on the forklift with a brand new one a big grin. As encouragement he repeated my own mantra to me: destroy it with finesse. Maybe it didn’t feel so bad because it didn’t go on for too long . . . but I dug bottling. After all that work, you can look at the pallets piled high and actually see your accomplishment. What’s more – a consumer can now get their hands on a bottle. It’s out there to be loved and judged. As usual in this job, there was little room (ie, none) for error, slack, or forgetfulness and there is a fine line between being in the zone and zoning out. And I am always trying to balance my ambition to handle the seemingly endless stream of new tasks and the humility to know when I’m not handling it. Which still happens on a fairly frequent basis. After we bottled, we waxed bottle tops – Donelan practice. In my own defense (here where no one can stop me) I made serious strides in this arena over the course of this day, in which, along with a team of ten temp workers, John, Joe, and I waxed the tops on 6 pallets worth of wine and yet managed to be well below historical Donelan waxing averages. Sigh. I have confidence in my ability to grow, but the learning curve seems to love me more than I love it. I try to walk the line between forgiving myself for what I can’t help coming up short in and asking still more of myself every day. I’ve absorbed an enormous amount from my friends and coworkers, but it’s just a start and there are days I wish I could sit people down and read off a list of the skill set that used to make me feel equipped on a daily basis and that doesn’t do much for me these days. Like . . . I know sizable chunks of Fowler’s Modern English Usage by memory? I can recite a good dozen (good) poems? I can talk about a Courbet painting till I’m blue in the face and recount the story of the unification of Italy like the soap opera that it is. I have a lot to say about why you’re wrong and why Ezra Pound might or might not agree with either of us. The net yield of all of that here in wine country is pretty slim. It still fills my spirit and nurtures the part of me that thinks about becoming a lawyer because I love to argue or a teacher because I want to inspire the nonbelievers with the rewards of T.S. Eliot and Wallace Stevens. The truth is, though, that as much as I am out of my depths here, I was hardly done being out of my depths when I graduated college. My mentors, advisers, professors, heroes on the page and off – they all knew scads more about what I loved learning about. I was just used to the kind of things I didn’t know. Right now the challenge I’ve set myself is learning that which I still know so little about, and that I will continue to know little about until, well, I know more. Until I actually work the harvest, and maybe more harvests. Or get a degree. Crazier things have happened. The big news is that Donelan is expecting fruit at the end of this week. We hauled out the crusher-destemmer, the sorting table (which looks more like painter’s scaffolding than any table I’ve ever seen), and the hopper. 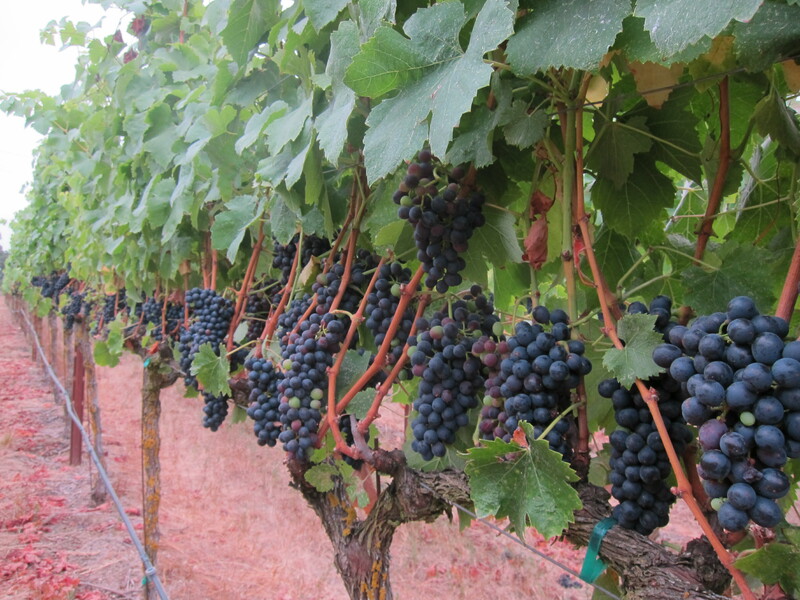 And we – by which I mean we at Donelan, my friends at other wineries, and this whole, buzzing, ripening region – are pumped.